If the tangle of wires around laptop drives you crazy, Intel has developed a wireless dock that could eliminate a lot of those cords. 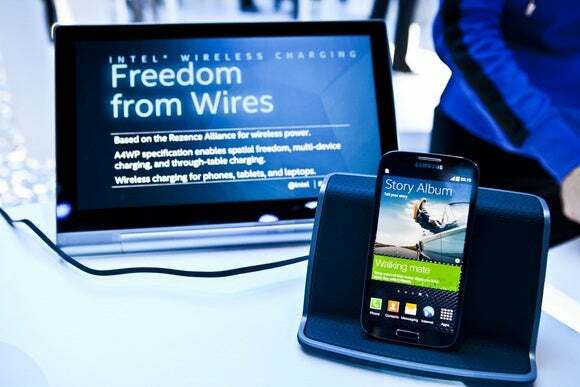 Intel Wireless Docking uses a device that talks to a laptop over high-speed wireless and is linked to displays, printers, external hard drives and other peripherals via conventional cables. Connecting a laptop wirelessly to a peripheral is as easy as bringing it within communication range. For example, a laptop near the dock will automatically recognize a monitor that’s attached to the dock and start beaming images wirelessly. The dock can support up to two high-definition displays, cameras, storage drives and other peripherals, Intel said in a blog post. The dock links to laptops using WiGig, which can transfer data at speeds as high as 7Gbps (bits per second). WiGig is faster than current conventional Wi-Fi technologies but is designed for shorter range applications such as docking and HD video transfer. To pair with the dock, laptops need to be WiGig compatible, and few are today. PC makers plan to adopt WiGig and Intel’s docking technology, especially for enterprise systems. The dock has been developed as a stepping stone to Intel’s larger plan to completely eliminate wires from laptops. It’s a teaser of wire-free technologies that will be built into laptops in the second half this year, when Intel ships its chips based on the Skylake architecture. Those laptops will wirelessly connect to WiGig-equipped peripherals directly, without a dock. Intel’s wire-free computing plan also includes bringing wireless charging to laptops. Ultimately Intel hopes users won’t have to carry power bricks or USB 3.0, DisplayPort or HDMI cables. Intel plans to introduce a prototype laptop that is free of ports and loaded with wireless technologies in the second half of this year.